If you’re excited for 2017’s Logan, the final film in the Hugh Jackman trilogy of standalone Wolverine films, the best place to start might not necessarily be the current Old Man Logan comics written by Jeff Lemire. Not because the current run is bad, but because the crazy nature of the current comic probably won’t jive with the somber film adaptation. Based on the trailer, and myriad of black-and-white set photos, it’s safe to imagine that the upcoming Logan film will be a pretty dark chapter in Wolverine’s life, possibly even the last. Reading the comics however, Old Man Logan paints a very different picture. Issue 14 begins with a missing Jubilee, and Logan playing babysitter with his partner, a retooled Sentinel robot turned X-Men ally. Together they watch over Jubilee’s baby as Logan tries to find clues regarding Jubilee’s missing whereabouts. And that doesn’t even include the team of monsters and Dracula. The Logan film undoubtedly borrows from the original Old Man Logan comic by Mark Millar where a lone Wolverine roams a post-apocalyptic Sacramento desert, battling all manners of nightmarish villains that embody the worst of comic book’s nihilistic impulses. The new Old Man Logan from Lemire does feature moments of extreme violence, and crushing sadness. In the first few issues, Old Man Logan, transported from an alternate dimension into the new, post-Secret Wars universe where Wolverine died, is very reminiscent of his Millar incarnation. He even begins his new life killing people on his self-made hit list of villains who will end up creating his nightmarish future. But Lemire’s Old Man Logan isn’t afraid to dig into the absurdity of having an older, grumpier Logan to pal around in a decidedly different Marvel Universe. 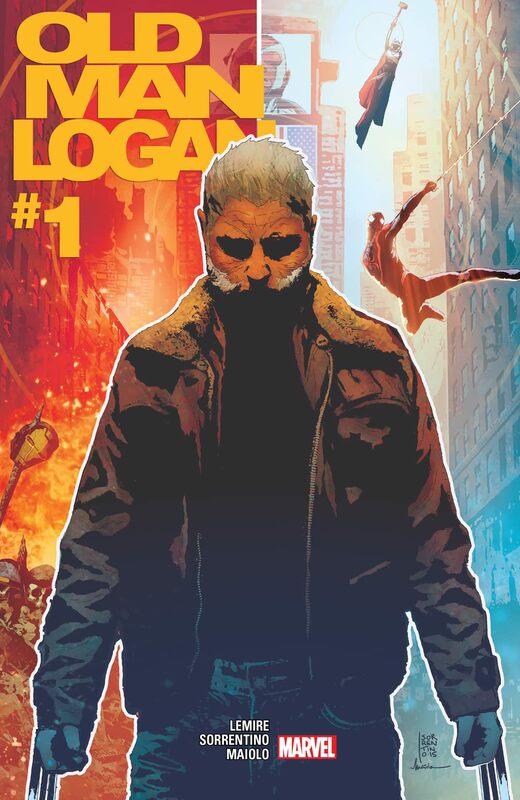 The new universe is set on avoiding the dark future of Old Man Logan’s and it looks like Logan is slowly learning this, allowing himself to become a little softer, maybe even a little sillier. Though I doubt even he expected to fight a Dracula. Through a weird turn of events Jubilee became a vampire awhile back, and it looks as if she’s back in the clutches of Dracula. Unfortunately for him, Logan considers Jubilee another one of his many mentees, and not even Dracula can stop Logan from protecting his friends. So no, Logan probably won’t feature babysitting sentinels and Draculas, but Old Man Logan’s character across the different issues remains fairly consistent: bitter, sad, sarcastic. All the traits that will most likely present in the film, but distilled in a decidedly more realistic universe. Old Man Logan #14 is available now in comic book stores and digital retailers.